Sometimes what seems like the right thing to do is the worst thing to do. That’s the way it is with burn care. The usual treatment for cuts, scrapes and wounds is a little antibacterial ointment and a bandage—but that’s not so for burns. Because the skin is the body’s natural source of protection from infection, burned skin requires special treatment. Our natural instinct is to slather a burn with an ointment, but Anna Myers, MD, Waco Pediatric Clinic at Hillcrest, says that’s the wrong thing to do. “The correct treatment for a minor burn is to wash it gently with soap and cool water and apply a cool compress, such as wet sterile gauze or a washcloth. Then cover the burn with a clean, dry bandage. That’s all. If you have some pain, you can take acetaminophen or ibuprofen,” says Dr. Myers. You want to flush a burn immediately with cool water for several reasons. Cool water stops the burning process and lowers the skin temperature, reduces the pain, and halts or decreases the swelling that comes with a burn. “Don’t put any over-the-counter ointment, oils, or butter on any burn,” advises Dr. Myers. They trap the heat inside the burn without providing any additional protection against infection. “You should avoid ointments or creams unless prescribed by a physician. Silvadene is a commonly prescribed cream or ointment for burn care to help prevent infection,” Dr. Myers says. “If there are blisters, don’t pop them,” Dr. Myers warns. “The blisters provide a layer of protection against infection. If the blisters pop on their own, trim them so they stay clean and continue serving their purpose of natural infection protection,” Dr. Myers says. Check the bandage daily, and if the burn seeps, run cool water over it again to clean it and cover it again with a dry bandage. There are three classifications of burns, noted by degrees. First-degree burns are the least severe and can be treated at home. Dr. Myers says they are marked by reddened skin without blisters and leave no scarring. They will be tender and sore. 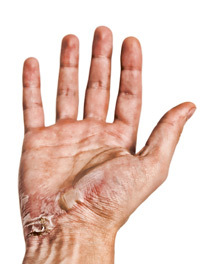 Second-degree burns will have moist blisters that may ooze; they’ll be painful, may result in scarring, and often take weeks to heal, says Dr. Myers. Third-degree burns are the most serious. Skin may be blackened or white, scarring likely will result, and skin grafting may be necessary. There might be no pain at first, as the nerve endings will have been burned, Dr. Myers says, and the pain won’t begin until the nerves and tissues are regenerated during the healing process. Most large burns require hospitalization. Dr. Myers says sometimes Plastic Surgery will provide burn care if damage is extensive or is on the hands, feet or face. If you are unsure if the burn is second or third degree, Dr. Myers advises that you seek treatment in the Emergency Department. Dr. Myers suggests you take extra care to avoid contact burns by keeping curling irons and straighteners out of reach of children, turning the handles of pots and pans on the stove in toward the wall, and prohibiting play around barbecue grills, fireplaces and fire pits. It’s also recommended, Dr. Myers says, to keep your tetanus shot up to date. Next Next post: FiveFingers® for your feet?